There are hundreds of types of sod grass available, and new varieties are developed every year. As with all plant choices, climate plays a big role in determining which type of grass will work best for you. Soil type, rainfall and other factors also come into it. As a general rule, cool-season grasses go dormant during the warm weather, and warm-season grasses go dormant during the coolest months of the year. In areas where it’s possible to have a green lawn all year round, you want a mixture of both these types. Zoysia grass – Zoysiagrass is a tough, aggressive, creeping, warm-seaon grass. It has a leaf texture that can range from coarse to fine depending upon the variety. Because it has some outstanding qualities, it is often advertised as a miracle grass. It is tolerant of heat and drought, but it also can take some shade and cool temperatures. Bermuda grass – Bermuda grass is one of the most popular of the warm season grasses. Bermuda grass can be easily planted from grass seed, sod or grass plugs. 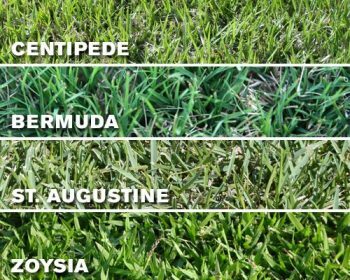 St. Augustine grass – St. Augustine grass is a widely used lawn grass along the Gulf Coast in the U.S., in Southern Mexico. The species is primarily of tropical origin and is native to sandy beach ridges, fringes of swamps and lagoons, salty and fresh water marshes and limestone shorelines. Centipede grass – Centipede grass is known for its excellent heat tolerance and extremely low maintenance requirements. A favorite of lawn owners interested in minimal upkeep. Centipede grass requires far less attention and input than other grasses in its growing region. However, Centipede has very specific climate and soil requirements that limits primarily in the Southeast. Bentgrass – In the past the use of bent grass, Agrostis stolonifera, was traditionally confined almost entirely to golf greens. Now many homeowners prefer bentgrass lawns because of their beautiful carpet like turf. This is in spite of the work of establishing and maintaining a bent grass lawn. Bluegrass – Poa pratensis, commonly known as Kentucky bluegrass, smooth meadow-grass, or common meadow-grass, is a perennial species of grass native to practically all of Europe, northern Asia and the mountains of Algeria and Morocco. Although the species is spread over all of the cool, humid parts of the U.S., however it is not native to North America. Fine fescues – Lawns in cool areas with plenty of shade will benefit from a turf sown with fine fescue. It is a standard turf grass that is bunching and perennial. This variety of fescue is often part of a grass mixture to create a northern shade tolerant grass that has low moisture and fertilizer needs. The grass stays green all year long in most regions and is drought tolerant. Ryegrass – These bunch grasses consist of two basic types; annual and perennial. Each type of ryegrass is planted as a pure strain or used in grass seed mixtures depending on the specific lawn, pasture or turf use desired. Ryegrasses are adapted into lawns mainly for their fast growing ability as a cool season grass. Check with your local lawn and landscaping and company for the types of sod available in your area or climate region. Ryno Lawn Care is the preferred landscaping partner for your sod grass needs, Click here for a quote and estimate.